Interface to PETSC linear solvers BC implementation hooks: addBCdiagValue (formMatrix) and addBCrhsValue (solveprivate) m_bccode should be encoded true for cells that are at the domain boundaries at formMatrix time. References PetscSolver< T >::m_dx, and PetscSolver< T >::m_prestring. References PetscSolver< T >::m_bb, PetscSolver< T >::m_defined, PetscSolver< T >::m_ksp, PetscSolver< T >::m_mat, PetscSolver< T >::m_rr, PetscSolver< T >::m_snes, and PetscSolver< T >::m_xx. Referenced by PetscSolver< T >::~PetscSolver(). Referenced by PetscSolver< T >::setup_solver(), and PetscSolver< T >::solve_mfree_private(). Reimplemented in PetscSolverPoisson< T >. References CH_assert, PetscSolver< T >::m_dx, and PetscSolver< T >::m_homogeneous. Referenced by PetscSolver< T >::define(), and PetscSolverPoisson< T >::define(). References PetscSolver< T >::define(), and LinearOp< T >::dx(). References PetscSolver< T >::addBCrhsValue(), BaseFabRealSetVal, BoxIterator::begin(), CH_assert, CH_START, CH_STOP, CH_TIMER, CH_TIMERS, BoxLayout::get(), PetscSolver< T >::getRegFab(), PetscSolver< T >::m_bb, PetscSolver< T >::m_dx, PetscSolver< T >::m_gids, PetscSolver< T >::m_ksp, PetscSolver< T >::m_mat, PetscSolver< T >::m_null, PetscSolver< T >::m_snes, PetscSolver< T >::m_xx, BoxIterator::next(), BoxIterator::ok(), PetscSolver< T >::putPetscInChombo(), PetscSolver< T >::setup_solver(), and DataIterator::size(). Referenced by PetscSolver< T >::solve(). Solve a_op*a_phi = a_rhs using the PETSC matrix free functions The preconditioner (for which a matrix is formed) need not be the same as the actual operator. References PetscSolver< T >::addBCrhsValue(), PetscSolver< T >::apply_mfree(), BaseFabRealSetVal, BoxIterator::begin(), CH_assert, CH_SPACEDIM, CH_TIME, LinearOp< T >::clear(), LinearOp< T >::create(), BoxLayout::get(), PetscSolver< T >::getRegFab(), PetscSolver< T >::ksp_monitor_pout(), M, PetscSolver< T >::m_bb, PetscSolver< T >::m_dx, PetscSolver< T >::m_gids, PetscSolver< T >::m_ksp, PetscSolver< T >::m_Lphi_mfree, PetscSolver< T >::m_mat, PetscSolver< T >::m_nz_init_guess, PetscSolver< T >::m_op_mfree, PetscSolver< T >::m_phi_mfree, PetscSolver< T >::m_prestring, PetscSolver< T >::m_xx, N, BoxIterator::next(), LayoutIterator::ok(), BoxIterator::ok(), PetscSolver< T >::putPetscInChombo(), PetscSolver< T >::setup_solver(), and DataIterator::size(). Referenced by PetscSolver< T >::solve_mfree(). References CH_TIME, PetscSolver< T >::m_homogeneous, PetscSolver< T >::m_Lphi_mfree, PetscSolver< T >::m_op_mfree, PetscSolver< T >::m_phi_mfree, PetscSolver< T >::putChomboInPetsc(), and PetscSolver< T >::putPetscInChombo(). References LevelData< T >::define(), LevelData< T >::disjointBoxLayout(), LevelData< T >::exchange(), LevelData< T >::ghostVect(), PetscSolver< T >::m_bb, PetscSolver< T >::m_gids, PetscSolver< T >::m_mat, PetscSolver< T >::m_xx, and PetscSolver< T >::putPetscInChombo(). References PetscSolver< T >::create_mat_vec(), PetscSolver< T >::m_bb, PetscSolver< T >::m_mat, PetscSolver< T >::m_xx, PetscSolver< T >::putChomboInPetsc(), and PetscSolver< T >::putPetscInChombo(). Reimplemented in PetscSolverViscousTensor< T >. Referenced by PetscSolver< T >::create_mat_vec(). References PetscSolver< T >::m_rr, norm(), and PetscSolver< T >::putPetscInChombo(). Referenced by PetscSolver< T >::putChomboInPetsc(), PetscSolver< T >::solve_mfree_private(), and PetscSolver< T >::solve_private(). References BoxIterator::begin(), CH_assert, CH_SPACEDIM, CH_START, CH_STOP, CH_TIMER, CH_TIMERS, PetscSolver< T >::create_mat_vec(), PetscSolver< T >::formMatrix(), PetscSolver< T >::ksp_monitor_pout(), PetscSolver< T >::m_defined, PetscSolver< T >::m_function, PetscSolver< T >::m_jacobian, PetscSolver< T >::m_ksp, PetscSolver< T >::m_mat, PetscSolver< T >::m_nz_init_guess, PetscSolver< T >::m_prestring, PetscSolver< T >::m_rr, PetscSolver< T >::m_snes, BoxIterator::next(), BoxIterator::ok(), and LayoutIterator::ok(). References BoxIterator::begin(), CH_assert, CH_TIME, LevelData< T >::define(), MayDay::Error(), LevelData< T >::exchange(), PetscSolver< T >::formMatrix(), BoxLayout::get(), PetscSolver< T >::getNNZPerRow(), PetscSolver< T >::m_bb, PetscSolver< T >::m_bccode, PetscSolver< T >::m_defined, PetscSolver< T >::m_gid0, PetscSolver< T >::m_gids, PetscSolver< T >::m_mat, PetscSolver< T >::m_rr, PetscSolver< T >::m_xx, BoxIterator::next(), Box::numPts(), BoxIterator::ok(), LayoutIterator::ok(), BaseFab< T >::setVal(), PetscSolver< T >::supportNNZExact(), and IntVect::Zero. Referenced by PetscSolver< T >::applyOp(), and PetscSolver< T >::setup_solver(). References BoxIterator::begin(), BoxLayout::get(), PetscSolver< T >::getRegFab(), PetscSolver< T >::m_gid0, PetscSolver< T >::m_gids, BoxIterator::next(), BoxIterator::ok(), and DataIterator::size(). Referenced by PetscSolver< T >::apply_mfree(), PetscSolver< T >::applyOp(), PetscSolver< T >::computeResidual(), PetscSolver< T >::normInfinity(), PetscSolver< T >::solve_mfree_private(), and PetscSolver< T >::solve_private(). References PetscSolver< T >::addBCrhsValue(), BoxIterator::begin(), CH_TIME, BoxLayout::get(), PetscSolver< T >::getRegFab(), PetscSolver< T >::m_dx, PetscSolver< T >::m_gids, BoxIterator::next(), BoxIterator::ok(), and DataIterator::size(). Referenced by PetscSolver< T >::apply_mfree(), and PetscSolver< T >::applyOp(). Implemented in PetscSolverViscousTensor< T >. Referenced by PetscSolver< T >::create_mat_vec(), and PetscSolver< T >::setup_solver(). 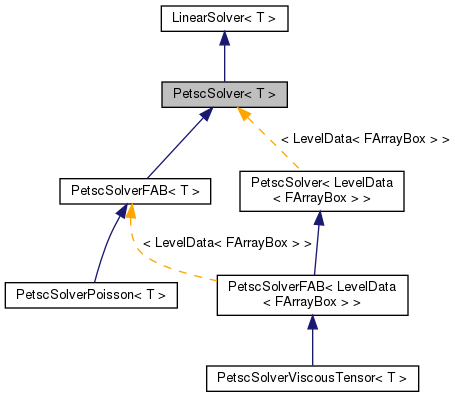 Implemented in PetscSolverFAB< LevelData< FArrayBox > >. Referenced by PetscSolver< T >::putChomboInPetsc(), PetscSolver< T >::putPetscInChombo(), PetscSolver< T >::solve_mfree_private(), and PetscSolver< T >::solve_private(). References CH_assert, and PetscSolver< T >::m_null. Referenced by PetscSolver< T >::apply_mfree(), and PetscSolver< T >::solve_mfree_private(). public member data: whether or not to use inhomogeneous boundary conditions. Referenced by PetscSolver< T >::apply_mfree(), PetscSolver< T >::define(), and PetscSolver< LevelData< FArrayBox > >::setHomogeneous(). Referenced by PetscSolver< T >::define(), PetscSolver< T >::PetscSolver(), PetscSolver< T >::putChomboInPetsc(), PetscSolver< T >::solve_mfree_private(), and PetscSolver< T >::solve_private(). Referenced by PetscSolver< T >::applyOp(), PetscSolver< T >::computeResidual(), PetscSolver< T >::create_mat_vec(), PetscSolver< T >::destroy(), PetscSolver< T >::setup_solver(), PetscSolver< T >::solve_mfree_private(), and PetscSolver< T >::solve_private(). Referenced by PetscSolver< T >::applyOp(), PetscSolver< T >::computeResidual(), PetscSolver< T >::create_mat_vec(), PetscSolver< T >::destroy(), PetscSolver< T >::solve_mfree_private(), and PetscSolver< T >::solve_private(). Referenced by PetscSolver< T >::create_mat_vec(), PetscSolver< T >::destroy(), PetscSolver< T >::normInfinity(), and PetscSolver< T >::setup_solver(). Referenced by PetscSolver< T >::destroy(), PetscSolver< T >::setup_solver(), and PetscSolver< T >::solve_private(). Referenced by PetscSolver< T >::destroy(), PetscSolver< LevelData< FArrayBox > >::getKSP(), PetscSolver< LevelData< FArrayBox > >::setOptionsPrefix(), PetscSolver< T >::setup_solver(), PetscSolver< T >::solve_mfree_private(), and PetscSolver< T >::solve_private(). Referenced by PetscSolver< T >::create_mat_vec(), PetscSolver< T >::destroy(), PetscSolver< LevelData< FArrayBox > >::resetOperator(), and PetscSolver< T >::setup_solver(). Referenced by PetscSolver< LevelData< FArrayBox > >::setFunctionAndJacobian(), and PetscSolver< T >::setup_solver(). Referenced by PetscSolver< T >::PetscSolver(), PetscSolver< LevelData< FArrayBox > >::setOptionsPrefix(), PetscSolver< T >::setup_solver(), and PetscSolver< T >::solve_mfree_private(). Referenced by PetscSolver< T >::setNull(), and PetscSolver< T >::solve_private(). Referenced by PetscSolver< LevelData< FArrayBox > >::setInitialGuessNonzero(), PetscSolver< T >::setup_solver(), and PetscSolver< T >::solve_mfree_private(). Referenced by PetscSolver< T >::computeResidual(), PetscSolver< T >::create_mat_vec(), PetscSolver< T >::putChomboInPetsc(), PetscSolver< T >::putPetscInChombo(), PetscSolver< T >::solve_mfree_private(), and PetscSolver< T >::solve_private(). Referenced by PetscSolver< T >::create_mat_vec(), and PetscSolver< T >::putPetscInChombo().